Tech beat the Syracuse Orange 73-59 in a one-sided thrashing on the road, knocking off the 11-5 Orange in front of a raucous Carrier Dome crowd. Jose Alvarado led the charge with 20 points, two assists and three rebounds. Other notable performances included those of James Banks, Abdoulaye Gueye and Curtis Haywood II. The game started with Tech coming out hot, shooting over 50 percent from the field in the first half. The Jackets improved even further on their most efficient shooting night of the year, averaging 68.2 percent shooting in the second half. This performance was a huge improvement for Tech, whose offense ranks as on of the worst in the ACC. More impressive still is that Tech’s stellar shooting night came against Syracuse’s elite zone defense, a signature of Syracuse coach Jim Boeheim. Tech avoided one of their biggest weaknesses during the game by going for points in the paint and avoiding the three point line — Tech took just 12 three-pointer shots in the game. Instead, the Jackets focused on lobbing passes to their big men on the inside, where Evan Cole, Abdoulaye Gueye and James Banks III combined for 26 points. The strategy made for the best possible use of Tech’s possessions, something the team struggled with earlier in the season. Tech’s defense was commanding during the game with the Jackets creating long scoring droughts for the Orange as the game progressed. Forcing and capitalizing on turnovers, Tech grew their lead quickly at the start of the second half. Syracuse had 19 turnovers in the game while Tech capitalized with 17 points on turnovers. 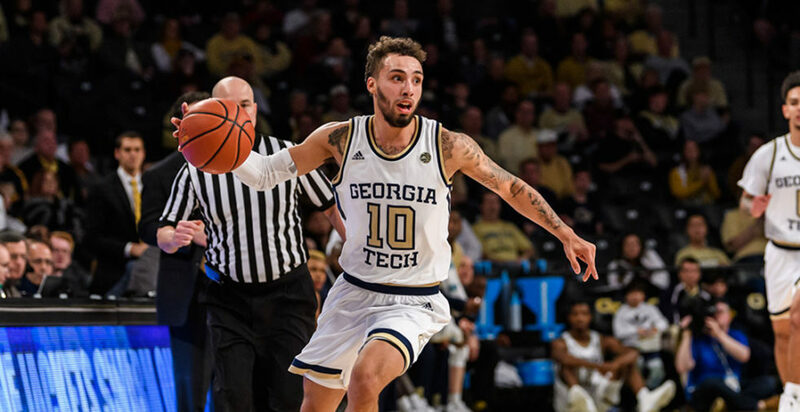 While it helped that the Jackets’ shots were falling — Tech racked up 38 two-point makes — these turnovers gave Tech transition opportunities that turned a close win into a blowout. Looking forward, Tech is ranked tenth in the nation in defensive efficiency by KenPom.com — a strong showing for an otherwise inconsistent Tech team. At times such as their win over Syracuse and even much of their close loss to Virginia Tech, Tech has looked very good. At other times, they have lost at home to Gardner Webb. In their big wins, Tech’s defensive switches from zone to man has caused confusion for their opponents. As Tech proceeds with ACC play, the Jackets’ next few opponents include Louisville, Notre Dame, Duke, UNC and Florida State — a difficult stretch, particularly the three games against Duke, UNC and Florida State. These opponents require the type of play Tech showed against Syracuse if the Jackets want to sustain their hot start to ACC play. Though, as Syracuse’s win against Duke and Wake Forest’s win against North Carolina State prove, there is at least some degree of parity in the ACC this season, which can play into the Jackets’ favor. With enough effort on both sides of the ball, the Jackets have a solid chance at an upset in any of the games in that stretch. In order to shock the ACC, it will require a strong effort on the part of Tech’s leading scorer, Jose Alvarado, who has averaged 13.9 points per game this season. His scrappy play, effort and basketball IQ have cemented him as the keystone in Josh Pastner’s rotation. In addition to points and assists, he also leads the team in steals per game and is very good at creating turnovers and opportunities. Tech’s offense has also been greatly assisted from behind the arc by both Brandon Alston and Khalid Moore, both of whom are shooting over 40 percent from three, giving the Jackets threats from deep and complementing Alvarado and James Banks III as scoring threats in the paint. With conference play underway, Tech looks to carry the momentum from an impressive Syracuse win with them as the road gets even tougher ahead for Alvarado, Banks and the rest of Tech’s young but battle-tested team. Such is life in the ACC.